I cannot be the only one super duper extremely excited!! Summer is the season full of possibilities, lazy days, and (most importantly) shenanigans! In order to celebrate such shenanigans, I've decided it is time for a summer-tastic giveaway. One lucky person will win one (1) summer release that either I've read and adored or I'm dying to read. This giveaway is available to all areas that The Book Depository ships to. I'm going to my timeshare hotel at the end of August. I'll be reading and catching up on blogging as I've just come back from a blogging hiatus! I am looking forward to going to the beach! The sand, the surf, the waves.... and also catching up on blogging - I'm a little behind. Thanks for the giveaway! My plan for summer is mostly work but outside of that to spend as much time outdoors as I can. My plan is to get through winter without freezing, have no idea what i will do by the time summer finally gets back to Australia. I'm working full time now so trying to find more time to read all my books! My plans are heading to the beach, helping my cousin to plan her wedding, and read as many books as possible. It should be a jam-packed summer. Anyway, have a wonderful summer and thanks so much for the giveaway!! 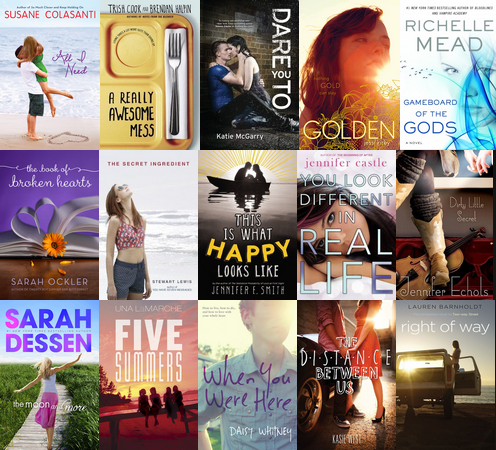 This is such a cool giveaway *_* and what great summer reads, woah I feel my tbr list extending already! I plan to catch up on some reading! Work on thesis and hopefully finish it. My summer plans basically consist of me being at home and reading books :3 Maybe hang with friends. Thanks for the giveaway!